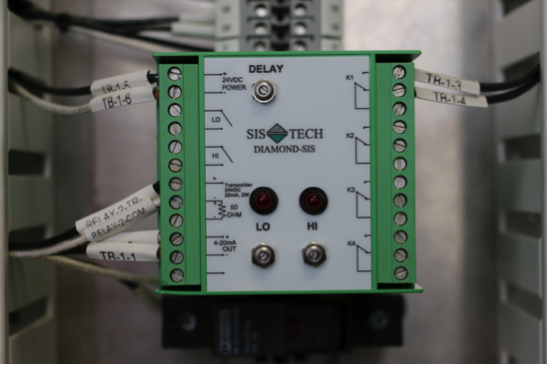 The DIAMOND-SIS® has over 2 million online hours without a dangerous failure rate or spurious incident. Certified to IEC 61508 SIL 3. FM Approved Class I Division 2. Cyberproof via air gapped and non-programmable countermeasures. Independent of process control system. Low capital and installed cost. Local panel with status indication/alarm, manual reset, and manual shutdown. Local panel reduces capital and installation costs by 90% compared to safety PLCs. Supports 24VDC, 110VAC, or 240VAC. Optional redundant power supplies, UPS or solar power. Control room communication options include hardwired, serial, or wireless. Health status with local indication and capability to repeat signals back to DCS. Complete IEC 61511 design package with proof test procedures. Annual service packages for long-term SIS maintenance support. Compliance with API 2350 and IEC 61511. Independent of automated tank gauging (ATG) system. Locally installed automated overfill protection system (AOPS). Cyberproof AOPS via air gapped and non-programmable countermeasures. Annual service packages for long-term AOPS maintenance support. Compliance with API 556, NFPA 85, NFPA 86, NFPA 87, and IEC 61511. Independent of burner control system. Locally installed burner management system (BMS). Supports local purge and light-off sequence. May be specified to execute any BMS function, such as purge, light off, fuel pressure, flame detection, pass flow, drum level, fire box pressure, and knock-out drum level. Cyberproof BMS via air gapped and non-programmable countermeasures. Annual service packages for long-term BMS maintenance support. Safe unheading of Coke drums. IEC 61511 compliant and proven in Coker applications. Independent of coke drum sequencing. Locally installed coke drum protection relies on overhead pressure, overhead temperature and inlet temperature. Cyberproof SIS via air gapped and non-programmable countermeasures. Pipeline and vessel high integrity protection system (HIPS). Compliant with API 521 and UG-140 of ASME Section VIII, Division 1 and 2. IEC 61511 compliant and proven in HIPS applications. Exceeds the performance of traditional relief valves. Dedicated to each high pressure hazard same as traditional relief valve. On-line diagnostic and repair capability. Cyberproof HIPS via air gapped and non-programmable countermeasures. Annual service packages for long-term HIPS maintenance support. Automated independent backup for DCS interlocks. Provides low cost separation of process control and SIS. Upgrades legacy DCS to IEC 61511 compliance.